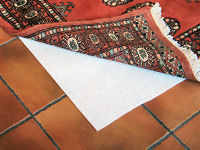 RugControl underlay for rugs. 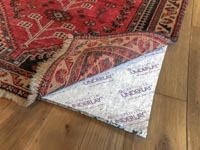 It's a dual purpose underlay and works to keep rugs safely in place on hard floors as well as stopping rugs creeping on fitted carpet. You can see from the picture that it's quite thin. This is to reduce the risk of tripping. You can add it to your basket at checkout if you are buying a rug. 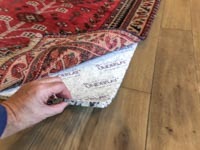 RugControl underlay needs to be cut to within about 2cms of the edge of your rug. You need to cover the whole rug. Don't try to economise by putting a strip at each end of the rug. It won't work! Hot Tip! Keep any left over bits of the underlay for the boot of your car. It stops the Tesco shopping sliding around. 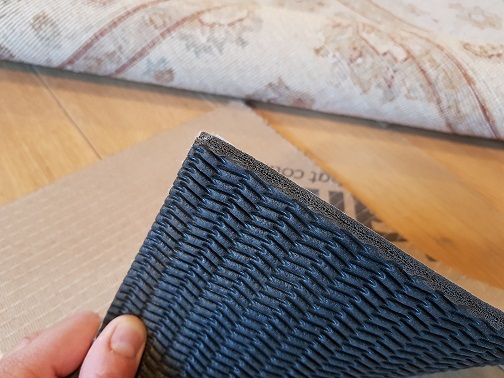 Comfort underlay for rugs. This is a great product that's best for larger rugs but feels great whatever size. This underlay is made of compcted foam It is only about 11 mm thick and it makes the rug feel very springy to walk on. 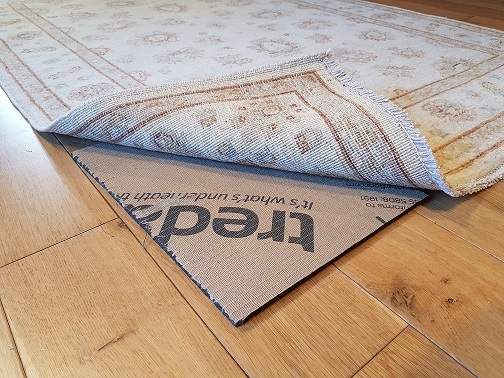 This rug underlay is not specifically made to stop rugs from slipping, but because of the extra wieght of the underlay it's much better than having the rug unsecured. Call us on 01234 712502 with the size if your rug and we will cut it to size for you. Duralay Heat underlay is specially designed for the floor with underfloor heating fitted. Tog rating 0.8 tog makes this underlay suitable to use with underfloor heating where low thermal resistance is needed. This underlay is made of a heavy weight cellular rubber. Thickness 9 mm.